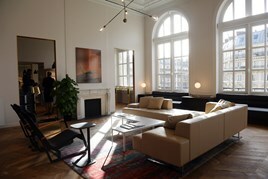 Eurostar opened its new Business Premier lounge at Paris Gare Du Nord on February 4. The operator has developed the facility because it says more business passengers are choosing the train over air travel. The facility was designed by Softroom, and is located on the top floor of the station’s 19th century building. It features marble fireplaces, a cocktail bar and intimate snug spaces, with the design meant to capture the spirit of a Parisian apartment. Complimentary WiFi, USB sockets and wireless chargers have also been installed. The cocktails are designed by London Cocktail Club exclusively for Eurostar. Contemporary art curated by the Hospital Club in London, and showcasing French artists, is displayed. The pieces will be on sale. There is also an open kitchen featuring a refreshed menu, with more offerings to be introduced through the year. The menu has been designed with Michelin star chef and Eurostar Business Premier Culinary Director, Raymond Blanc OBE.